Addison Close in Gillingham, Dorset is a housing estate on the edge of the town which was recently identified as an Action for Neighbourhood area by landlord Spectrum Housing. Arc worked with Spectrum’s Community Investment and Housing teams to look at ways in which their Birds, Bees, Bats, Bugs or 4Bs initiative could help support their efforts there. The result was an experimental partnership project combining art, ecology, horticulture and community, even local companies, with help and inspiration all along with the way from the local wildlife! The plan we came up with between us all was ‘to deliver a whole new approach to public spaces, creating beautiful, robust and imaginative planting that shifts and changes as it matures – to steadily reduce the need for mowing, spraying and trimming and create a scheme that gives colour, texture and change to the estate’s landscape and crucially, is designed to bring wildlife into view, meeting a need and a well-documented priority of Spectrum residents’. Arc brought along Island inspiration in the form of Ventnor Botanic Gardens’ curator Chris Kidd and the artists Eccleston George to support the project… with Artecology sculpture and mini-Botanic Gardens on every verge as a result. 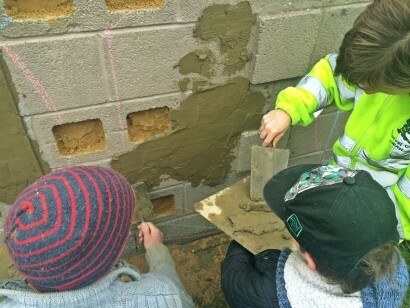 All the planting works were planned over weekend sessions to encourage participation and 2 ‘wildplay’ and nature-related art days were built in to enlist the support of local children. Over the 2 separate planting sessions and with the help of the children, plain amenity grass triangles and verges were packed with a palette of pollen and nectar-rich plants to attract and support wildlife from within and beyond the estate, and which when grown, will bring splashes of Ventnor Botanics colour to every corner. 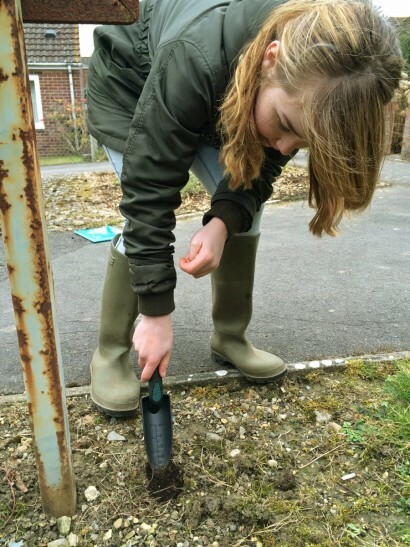 Even the cracks in concrete in one section were sown with local wildflower seeds as part of the wildplanting day. 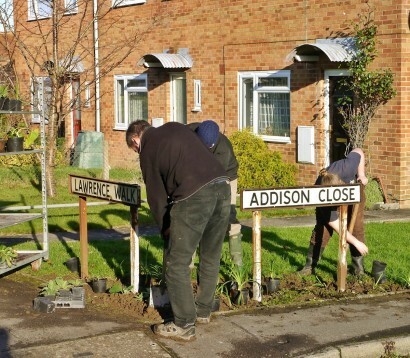 As with Lordshill, any planting introduced was designed to be as self-sustaining as possible – to avoid extra cost in maintenance but also to encourage grounds maintenance teams to avoid weedkilling etc. Again, contractors were kept informed on the work to be carried out and were supportive of the plans. Next up, art and ecology were cemented together at the heart of the estate as Eccleston George and the children used donated sand and hollow sticks they collected from the riverside to transform a redundant wall/bin-store into an Artecology bug and bee habitat/frieze! 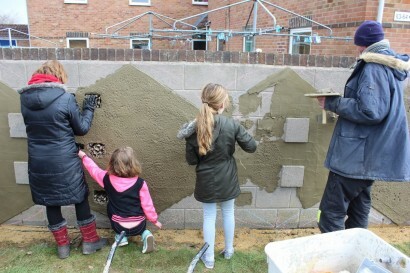 At every stage of the project, this small but determined gang of children rolled up to help and many residents contributed support and advice. Jewson’s very kindly supplied and delivered sand free of charge for the bee wall. It looks as if the Birds, Bees, Bats, Bugs/Artecology plan we drew up for Addison Close, like the planting, may hopefully be taking on a life of its own – it’s being used to inform local authorities and developers as they plan the expansion of Gillingham and as the Town Council plan to take on 70 acres of green space. Ian at Arc was asked by Wessex Water, (river catchment hosts for the area) to give a talk at a Council meeting on the subject of ‘Nature nearby’ and the Addison Close project. The partnership is keen to include Spectrum on the team and the connections with the very proactive Town Council have been strengthened as a result.